Making homemade sweet corn takes no time at all and the best part is that you always have a little bit of summer in a jar. Fall is finally in full swing which means the leaves are turning beautiful colours and sweaters, jackets and hats have come out of storage. The Fall season also means that the harvest has blossomed full force for everyone looking to enjoy the hearty crops. The fields around the house are a buzz with the combines taking in the corn crops and plowing for next years season. What vegetables are harvested in the Fall? Most vegetables that harvested in the Fall are vegetables such as Cauliflower, Rutabaga (Swede), Potatoes, Beets, Assorted Squash including Pumpkins, Plums, Pears, Peas, Peppers, Garlic, Peaches, Plums, Eggplant (Aubergine), Beans, Apples, Celery and so on. Knowing what fruits and vegetables to buy in-season and planning your meals around them will save you money in your grocery budget. My boys are nearing the end of football and looking forward to the playoffs which means more time for me in the kitchen. Having more time at home in the kitchen gives me the opportunity to finish up any canning and freezer meals that I need to complete before old man winter arrives. As you all know my friends always know that I will take any excess crops they have and turn it into something delicious. Whether it’s canning, freezing or baking I can create a recipe for just about any ingredient that comes my way. Yesterday I was fortunate to have my friends mother drop off some homegrown sweet corn. Immediately in my head I was thinking about new corn recipes that I could create. Now I am not one for saying no to free food so I froze some of the sweet corn and the rest I made into this gorgeous sweet corn relish. One thing you will notice right from the start is that the sweet corn relish is simple to make and done in one pot so no fuss and no big mess to clean up. What I love about fresh sweet corn is the feeling of summer that I get when I put it in my mouth. Now that the snow will be making it’s arrival in the next couple of months it’s nice to have some goodies to fall back on when we want a bit of summer in our meals. The sweetness of the sweet corn relish ultimately is up to you. If you think that the one cup of sugar will be too much sweetness for you then adjust as you see fit. I can reassure you that this recipe is spot on and you will love it. If you drool at the sight of hamburgers, turkey burgers, veggie burgers, hot-dogs and just about anything you can use a condiment on than you should be bookmarking or printing this sweet corn recipe for future reference. 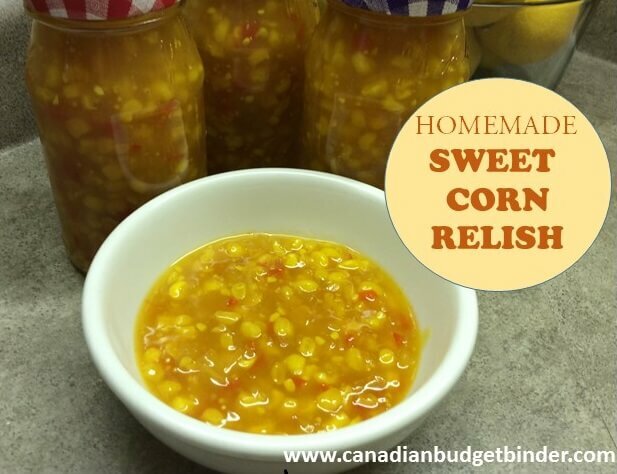 If you are ready to go and have sweet corn you want to use up then get your kitchen ready because you will have this sweet corn relish done relatively fast as it’s easy to make and will save you money. You can turn this sweet corn relish into a sweet corn relish dip if you want to switch it up and serve with tortilla chips. It would go great on tacos for taco night or in any layer dips for the next party you are going to attend. If you are new to canning don’t worry it’s easy to learn how to sterilize jars for canning so don’t be afraid of the process. Once you do it a couple of times you won’t even have to refer to instructions. If you love corn and relish you will go crazy for this homemade corn relish that is perfect on hotdogs, hamburgers, turkey burgers and just about anything that you want to give a sweet tangy taste too. Add sweet corn kernels into a large saucepan and add remaining ingredients. Bring just to the boil stirring to dissolve the sugar. Once boiled and sugar dissolved turn down and gently simmer for 30 minutes, stirring occasionally. Have jars ready hot and sterilized. If you find that it has not thickened you can always mix up some cornstarch and water. This will thicken it slightly. When cold store in a cool dry place for up to a year. There you have it, a lovely homemade sweet corn relish to have at your next BBQ or throughout the winter to top off your favourite meals. Nicola, my Mom has the same recipe of your homemade sweet corn relish. I just miss this dish because I grew up having this over our dining table. Now, I am independent, I really want to have this again. Ugh, I really miss it. This brought back memories of making corn relish years ago. Friends of a neighbour grew canner(sweet) corn and called them to go in the field after the harvesters. I was invited along and we filled garbage bags full off the ground that were missed during harvest. I think I had 3 big garbage bags full to use up and I made relish and froze a lot for the winter. Is was corn that would have been eaten by the raccoons or just plowed under and gone to waste so we were in our glory!! It’s amazing how much those big combines can miss!! Another time the two of us went into a turnip field after the harvest with our bags. Got a lot of small ones but I peeled boiled and froze them all for winter eating!! It really helps having friends that are farmers for commercial companies you can ask to go into the fields to glean goodies after the harvesters have been!! I’ve never had corn relish before but Nicola has shown me how easy it is to make. I love relish on my hotdogs and burgers but I want to try new condiments to broaden my condiment horizons. 🙂 I look forward to trying this recipe out.